I was given this book to review, but was not compensated in any other way for this post. All opinions are 100% my own or my son’s! This post contains affiliate links. My kids are voracious readers. They devour chapter books, asking for more reading time, carrying books they’re engrossed in with them wherever we go. I absolutely love it. I’m always on the lookout for quality chapter books to throw their way next, so I was thrilled to learn of a new young adult series from author Mark Batterson, best known for writing The Circle Maker. When I read the plot summary, I knew our nine-year-old, Big J, would be all about the Jack Staples series and I was right! What were your favorite parts of the story? What lessons did you learn from this book? I loved his answers, but more than that, I loved his enthusiasm about this book and the series as a whole. Immediately after finishing the first Jack Staples book, he asked when we could order the second and third! The first piece of good news is the second book in the series, Jack Staples and the City of Shadows, as well as the third, Jack Staples and the Poet’s Storm, are both available now. My bookworm is thrilled he doesn’t have to wait for them to be released. I totally know how he feels! 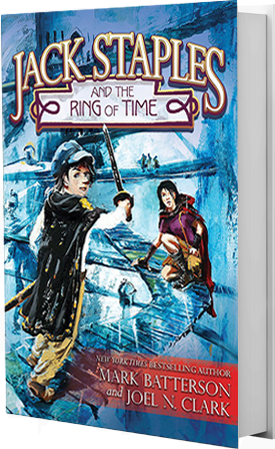 The second piece of good news is that I’m giving away a copy of Jack Staples and the Ring of Time for your child today, along with a copy of Mark Batterson’s book, Praying Circles Around the Lives of Your Children, just for you! To enter, just leave a comment telling me who in your life would love to read the Jack Staples series! I will pick one random winner Wednesday night, July 15th at 9PM CST! I’m always trying to get my 10 year old son to sit and read anything! My boys just like to move and sitting still is not there strong suit. Maybe this new series for him would be interesting and exciting. 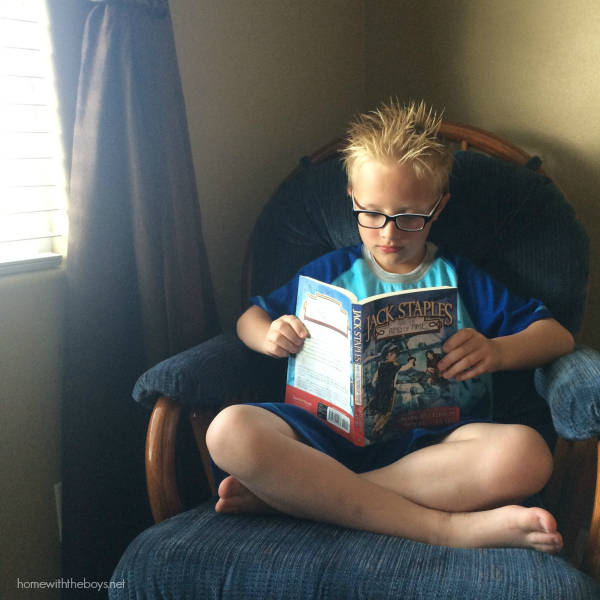 My oldest son who is 9 loves adventure…adventure in play, adventure in games and adventure in books. He has quite the imagination! And most importantly, he loves God and his adventures tend to reflect a ‘sensored’, God honoring style of play as compared to most kids his age. This book series sounds ‘up his alley’ and will help give him more ‘stories’ to incorporate in his imaginative play as well! I’m really excited to check these books out too after reading your son’s description! My 11 year old Skeeter would love to read a new series. He loves to find new exciting series his 13 year-old brother hasn’t read. Our soon to be 9 year old son, Thadeus. I have never heard of this author or book, thank you for bringing it to our radar. My son, Matthew, would love this story. He’s not thrilled when he has to read a chapter book. Maybe this would entertain him enough to keep reading on his own! This post was an immediate answer to a prayer I had yesterday! I was JuST asking God to show memore chapter books for my 8 yr old because every time we go to the library it’s hard to find good books and she LOVES to read! Thank you! My #2 boy would love to read these books! He also always has his nose in a good book. My 7 year old son would love this. We have been reading at night for about 45 mins before bedtime and it has become our favorite part of our day! My 10 yo boy loves to give new books a try. I’m just scared they won’t be at the library, he’ll get hooked and I’ll have to buy them! Thanks for your reviews. We’re always looking for good books!! My son who is 12 and my daughter who is 9 years old, both LOVE adventures stories. It’s a routine for us to read stories before bedtime. Thank you for the review. We are looking always for great books! I love finding adventurous books to read for kiddos!